A greener holiday We want to offer our guests a really sustainable holiday in a changing world. Stay with us, and you can genuinely pat yourself on the back. Your footprint will be light on the earth. We encourage the use of biodegradable, ethically sourced products and our site has grown from upcycling and charity shops. We have a policy to make use of reclaimed items and unrealised potentials from our ‘throw away’ society, adding a quirkiness and unique feel to your stay. See our Ethical page if you are interested to know more. Foot, bike and bus Scheme When you walk to a place, time allows you to take in your surroundings. We have kept our site car-free to give people an opportunity to live without their car and because it’s a wonderful thing to find us on foot. Being car-free also ensures disturbance is kept to a minimum for neighbouring houses and therefore protects the tranquillity of the area for you. We therefore have a foot, bike and bus policy scheme that we invite you to join. If you come to stay without a car,for 7 nights or more, you get a free bus pass for your stay, plus a pampering balm/oil made by Tara. If you do bring a car (maximum one per pitch) all parking is at The Guernsey Pearl Centre just below the site, and a 5 min walk away. We are on one of the quaint ‘green lanes’ that connect up the island, which makes cycling off the main road easier, although there is only a car speed limit of 35 mph. 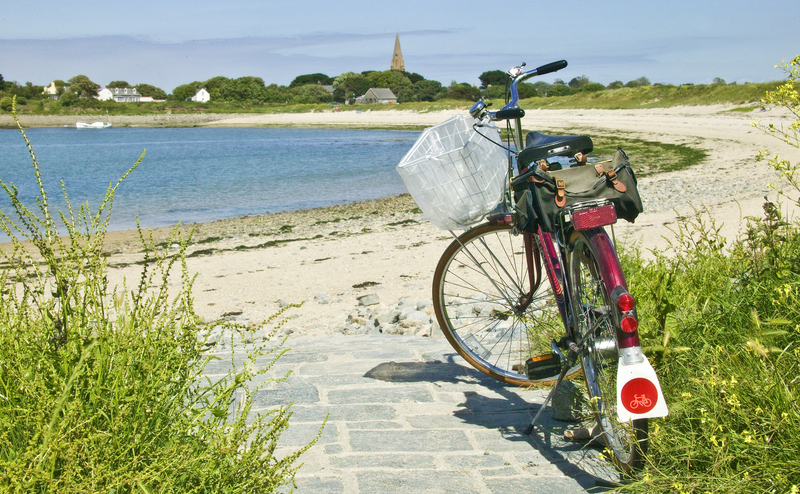 If you are cycling to and on Guernsey then it is worth taking the smaller roads (ask us for a route if you are with children) to WildGuernsey as unfortunately the car is King over here and not all the roads are quiet and quaint. The buses are good and cheap (£1 per journey) and we’ll provide a timetable and information in your Welcome pack. 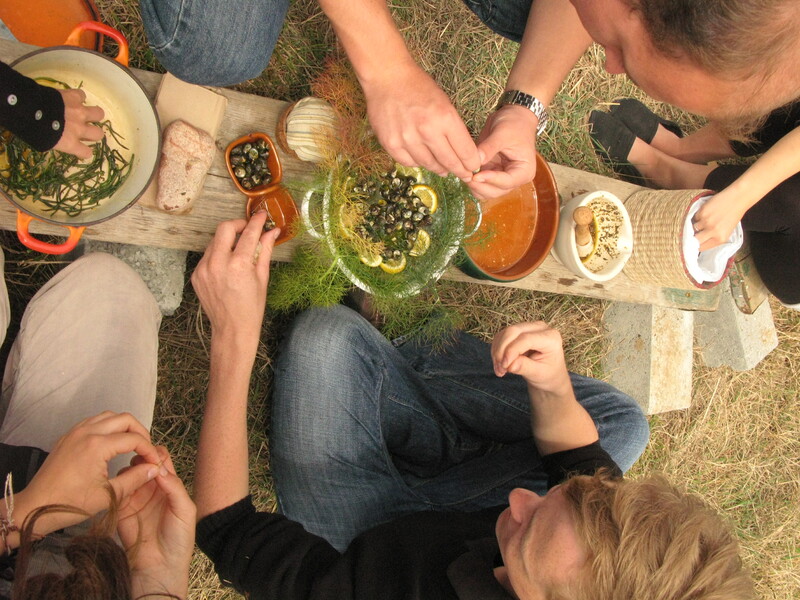 Local food You will be able to buy/catch/forage for a supper of freshly caught or gathered food and cook on an open fire or on a gas burner in the horse box field kitchen; no intensive farming, no packaging, no ai r miles, no exploitation – just simple, beautiful food and your own quiet satisfaction. Fresh Spider crab is sold on a saturday along the coast, 5 mins by car/20 min cycle, or catch your own on a fishing trip. There are two Farmers Markets, where local meat, fish and vegetarian food can be bought. Well worth an amble around on a Saturday morning. We offer Hedge veg. and WildFood baskets or you can walk or cycle to collect your own Guernsey grown produce with fruit, vegetables, goat cheese and milk up the road. Or indulge and buy one of our Food Baskets (prices vary, see below) or choose vegetarian dishes from our Veggie take out menu (see the daily blackboard) to sample the best, local food to take away and picnic on the cliffs or indulge on site with. The Farm Basket: Bacon, our eggs, mushrooms, tomatoes, crusty bread, butter, tea (herbal and black), coffee, milk, juice. The Bakers Basket: Croissants/pastries, Guernsey Gauche (local fruit loaf, toasted with Guernsey butter! ), butter, preserve, tea (herbal or black), coffee, milk, juice. The Wholesome Basket: Home mixed muesli, fruit selection, milk, juice, bio-yogurt, tea (herbal and black), coffee. Welcome Basket £30 – Awaiting for you: Chocolates, crispy snacks, soft fruit, Bubbles/local cider or beer/non-alcoholic. Cheese and Pate Basket £30 – For taking to the beach or have on the land watching the sunset: Cheese (cows and goats) selection, pate, baguette/biscuits, butter, bubbles, fruit preserve. £25. Pikelet batter ready to cook up yourself, and delivered to your tent – a wholesome batter mix with toppings (choose from: maple syrup, pecan, crème fraiche or sloe drizzle, berries, Guernsey cream or lemon curd, coconut, raspberries). A wood fired rocket stove for cooking on, wood and pans.